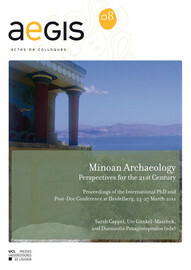 List of Contributors In: Minoan Archaeology: Perspectives for the 21st Century [online]. Louvain-la-Neuve: Presses universitaires de Louvain, 2015 (generated 22 avril 2019). Available on the Internet: <http://books.openedition.org/pucl/3091>. ISBN: 9782875585394. Cappel, Sarah, et al., (ed..) “List of Contributors”. Louvain-la-Neuve: Presses universitaires de Louvain, 2015. (pp. 381-382) Web. <http://books.openedition.org/pucl/3091>. CAPPEL, Sarah (ed.) ; GÜNKEL-MASCHEK, Ute (ed.) ; and PANAGIOTOPOULOS, Diamantis (ed.). Minoan Archaeology: Perspectives for the 21st Century. New edition [online]. Louvain-la-Neuve: Presses universitaires de Louvain, 2015 (generated 22 avril 2019). Available on the Internet: <http://books.openedition.org/pucl/2999>. ISBN: 9782875585394.